At the end of last year, The Weekend Gourmet crew spent a week exploring the best food, wine, and attractions in San Francisco, Sonoma, and Napa Valley. It was an amazing trip from start to finish! 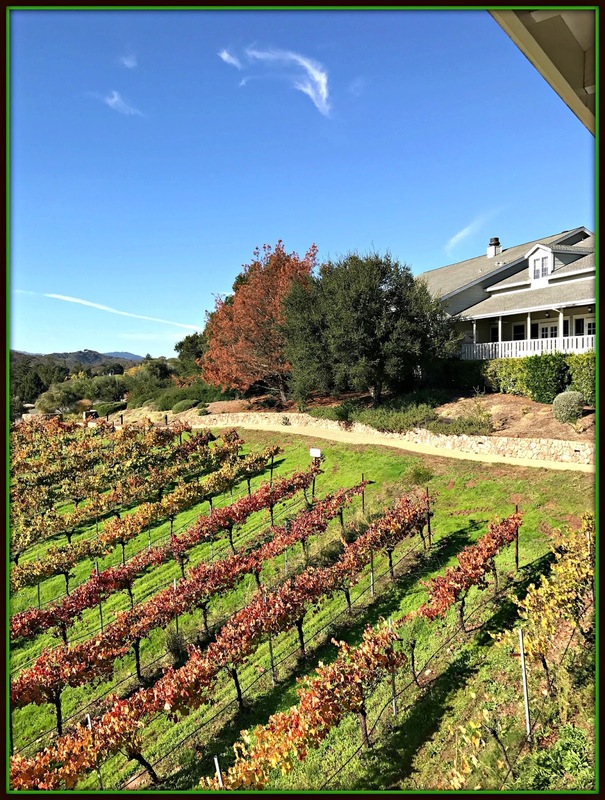 Now that the weather is warming up a bit and thoughts turn to Spring and Summer travel, it's the perfect time for me to tell you about our amazing 24-hour visit to Sonoma. We arrived midday on a Sunday, visited three of the area's best wineries, had dinner at the girl & the fig restaurant...and explored the luxurious Fairmont Sonoma Mission Inn & Spa. 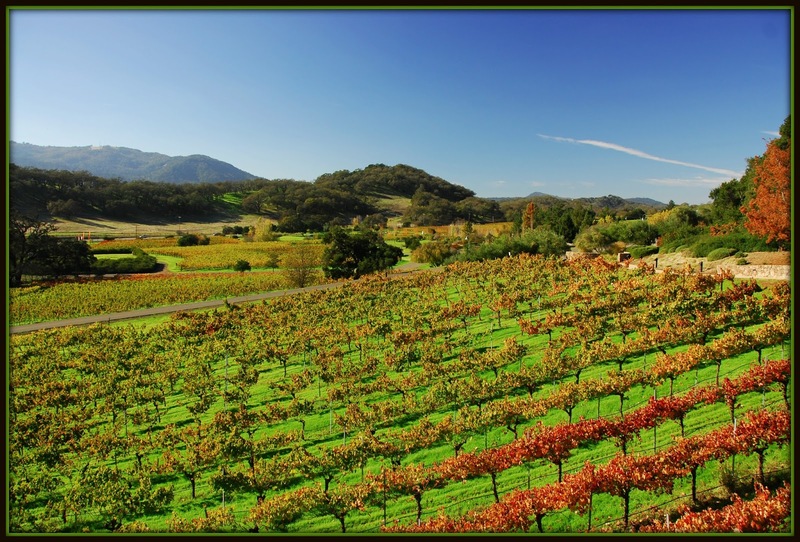 If you've never been to Sonoma, it's a short 45-minute drive from San Francisco and located to the west of Napa Valley. The Fairmont was an ideal home base for our Sonoma adventure -- an easy drive from the wineries we visited and the Downtown Square and absolutely gorgeous! We dropped our rental car with the friendly Fairmont valet, and headed inside the homey lodge-type main building -- stopping to admire the gorgeous fountain in the courtyard. The check-in process was simple and quick, and we were on our way to our room. 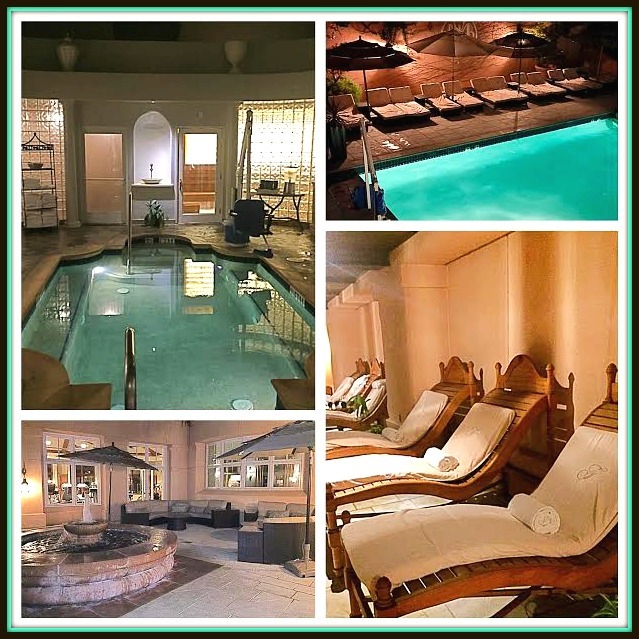 Of all the hotels and resorts in Sonoma County, only the Fairmont Sonoma Mission Inn & Spa offers guests an on-site luxury spa, championship golf course, and fine dining. You could truly drop off your car at the Fairmont at the start of a weekend getaway and never leave -- enjoying all of its amenities, spa, restaurants, and gorgeous decor! The mission-style architecture featured a mixture of light and dark-toned decor. Our room was spacious and also beautifully decorated in soothing tones. Our room featured a comfy Queen bed, flat-screen TV, a large bathroom, mini-bar refrigerator, and comfy terry cloth robes. After dropping our bags and freshening up a bit, it was time to go explore some wineries! Our first stop was WALT Wine's cozy tasting room, located in a house just off Sonoma's main square. We participated in a private ROOT 101 food and wine experience. This hour-long in-depth Pinon Noir tasting gave us a unique opportunity to isolate the quality and variety of distinct wines from regional Pinot Noir appellations. The tasting included five single vineyard wines sourced from appellations in the WALT collection. Each wine was paired with delicious seasonal, Pinot-centric small bite pairings from the girl & the fig. Our Host & Wine Educator Dan was very knowledgeable, walking us through each wine and telling us which bite to pair with each wine. Our tasting included a bonus glass of WALT Chardonnay. All of the wines were excellent -- and you really could tell differences in flavor depending on the region where the wine grapes were sourced. Our favorite bite on our plate was the Butternut Squash Sformaa with Pinot-Poached Cherries -- which is in the little glass jar in the picture above. This fabulous wine and food tasting is a MUST for pinot lovers who visit Sonoma! 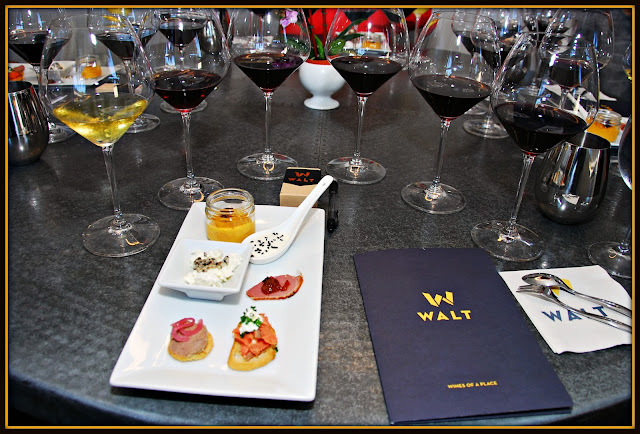 The WALT ROOT 101 tasting is offered daily at 11:00 a.m. and 2:00 p.m. 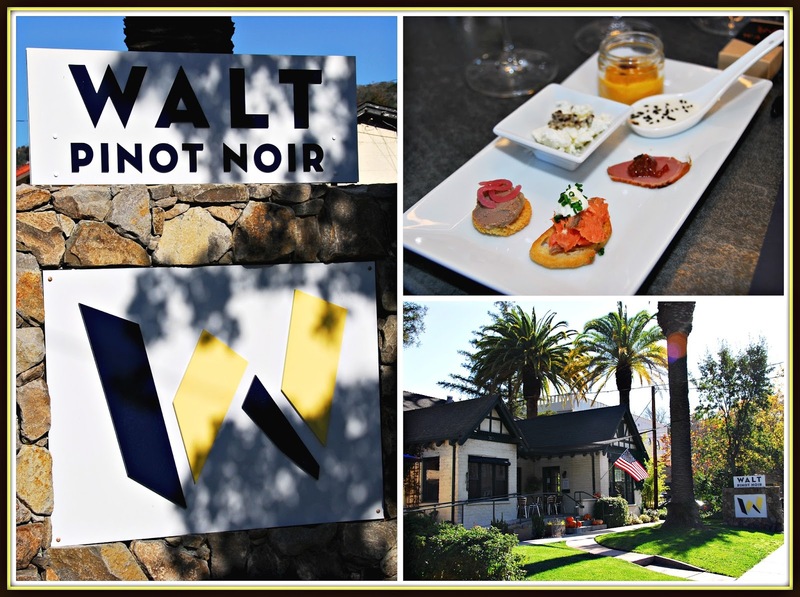 The price is $60/person, and all reservations must be made in advance by calling (707) 933-4440, ext 3102 or emailing tbromberger@waltwines.com. Our next stop was Arrowood Vineyards in nearby Glen Ellen. This picturesque winery offers a welcoming tasting room and veranda that offer breathtaking views of the picturesque vineyards! One of my college roommates lives in Northern California and drove out to meet The Weekend Gourmet crew for Arrowood's Wine and Artisan Cheese Pairing experience. This enhanced wine tasting highlights the winery's limited-production single vineyard wines paired with locally produced artisan cheeses. Our tasting included a lovely Viognier and three different Cabernets, paired with amazing cheeses...and even a chocolate rosemary truffle. We spent the next hour or so discussing the pairings, catching up, and enjoying the gorgeous scenery. 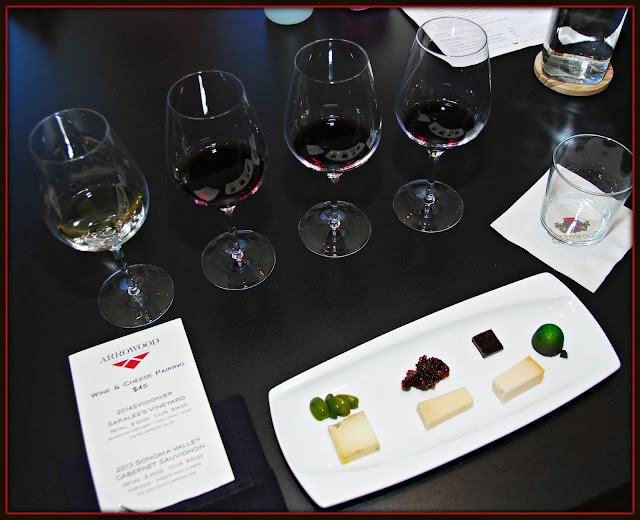 My personal favorite pairing was Arrowood 2013 Sonoma Valley Cabernet paired with Ewenique Sheep's Milk Cheese and Fig-Onion Marmalade. Face it...there are few better ways to spend an afternoon than drinking amazing red and white wine while enjoying gorgeous scenery! 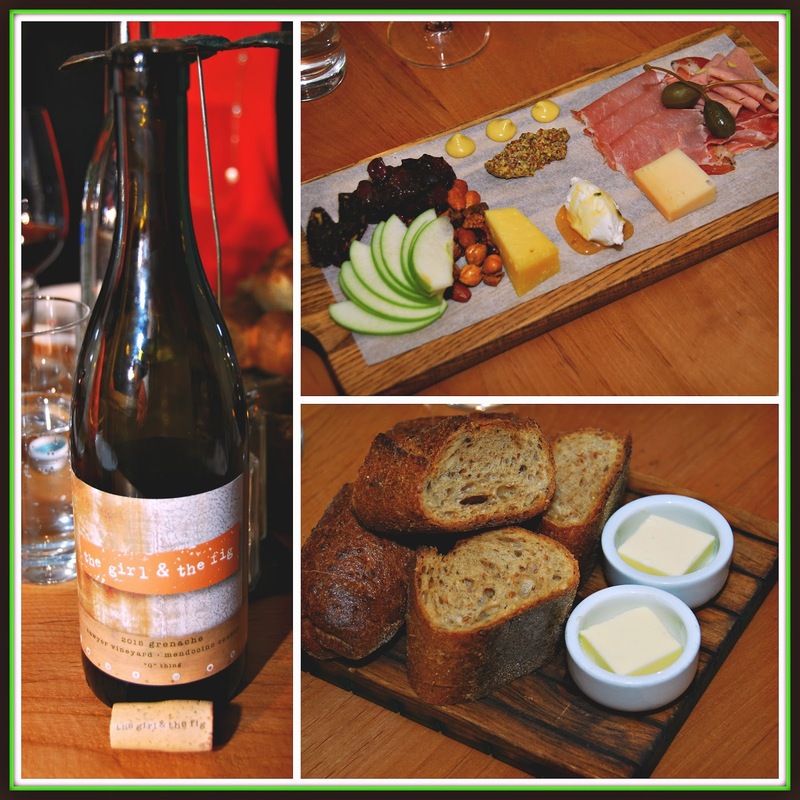 Arrowood's excellent Wine and Cheese Pairing experience takes 60-90 minutes and is $45/person. 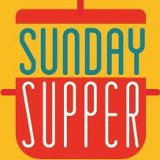 Reservations are required and can be made for up to eight guests/party by calling 707-935-2636. Our third and final winery stop of the afternoon was to enjoy sparkling wine at the Gloria Ferrer Caves & Vineyards as we drove back to Sonoma. 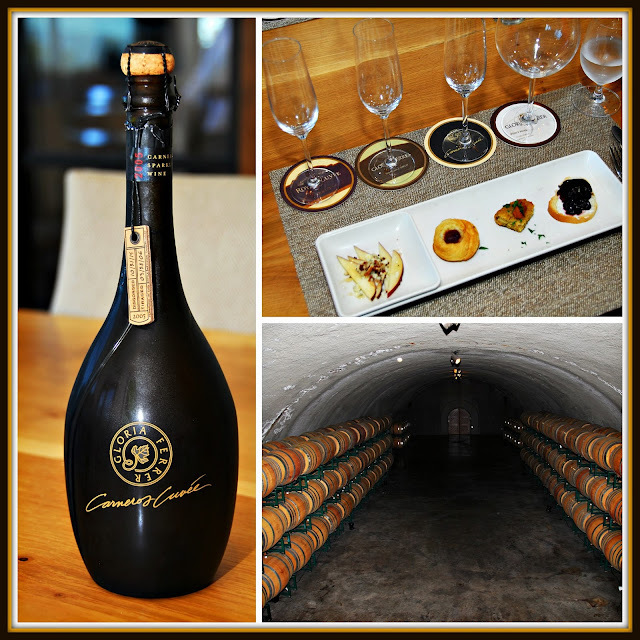 We took part in the enhanced Bubbles and Bites Tasting, along with a tour of their caves! The Bubbles and Bites tasting takes place in Gloria Ferrer's private Vista room, where our personal wine educator Samantha walked us through the sparkling wine and food pairings and shared some of Gloria Ferrer's history with us. The food bites were delicious, all of prepared by the in-house kitchen. Our tasting included four different sparkling wine varieties, each paired with a small bite. 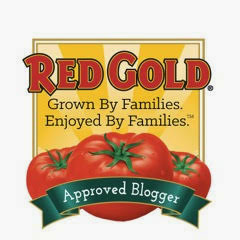 As the video below shows, we had a great time! The Gloria Ferrer Bubbles and Bites tasting takes place daily at 10:00 a.m., noon, and 2:00 p.m. The price is $60/person and lasts approximately 90 minutes -- which includes a tour of the ground and caves. For a reservations, groups must include at least two people -- and a maximum of 14 people. Reservations for this and other amazing tastings can be made online. After an afternoon of visiting wineries, we headed back to our home base at the Fairmont to take a brief nap and get cleaned up for dinner at the girl & the fig. Open on the Sonoma square since 1997, they offer French bistro-inspired dishes, wine, and cocktails in a relaxed, casual setting. 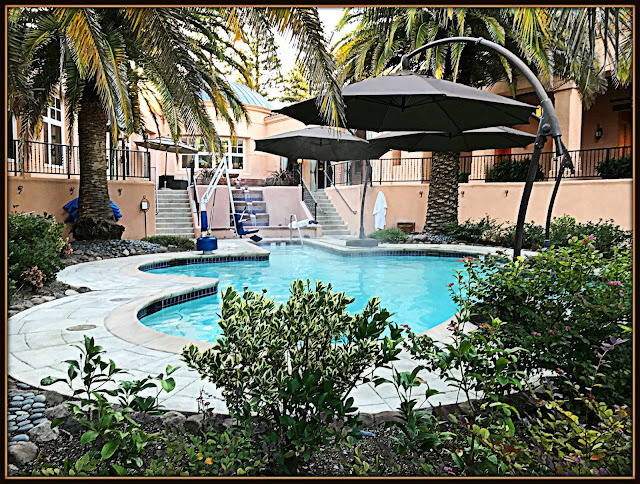 We arrived at the quaint square in downtown Sonoma, found plenty of ample parking near the restaurant, and enjoyed the cool evening during the brief walk to the girl & the fig. We were warmly greeted by the hostess and shown to our table in the restaurant's cozy main dining room. While we decided on which entrees to order, our friendly server opened a bottle of their house red wine for us to sip on. As we looked over the menu, he also brought some warm baguette and butter and The Works for us to enjoy. This cheese display was personalized to our preferred flavor profiles and included three types of cheese, cured meats, tart green apple, house-made fig cake, spiced nuts, and condiments. Everything was absolutely delicious -- this cheese plate was the perfect start to our meal! All of the entrees sounded absolutely delicious, but our server helped us select some of the girl & the fig's signature items. 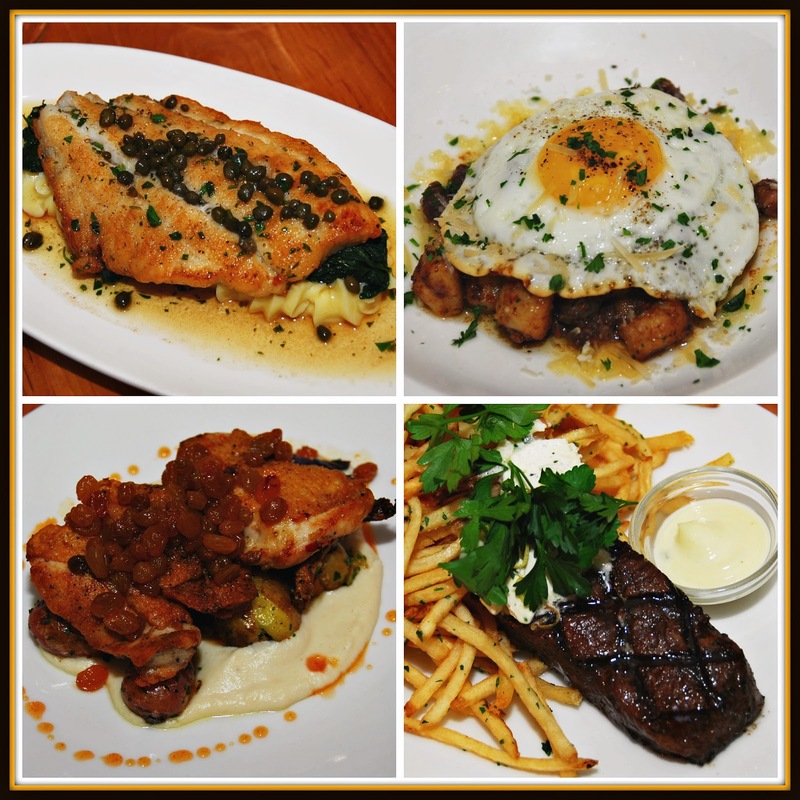 We ordered the Wild Flounder Meuniere with Yukon Potato Puree and Lemon Caper Brown Butter, Croque Madame Topped with Fried Egg and Roasted Potatoes, Pan-Seared Chicken Thighs with Golden Raisins, and Steak Frites. We enjoyed these entrees family style so all four of us got to enjoy at least a bite of each item! The restaurant describes its food as "country food with a French passion," and that's totally true! 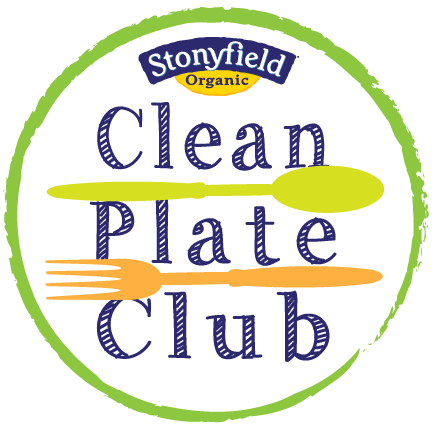 The food was expertly prepared and so delicious! For dessert, we opted to share a trio of the girl & the fig's signature menu items: Profiteroles with Tahitian Vanilla Ice Cream and Bittersweet Chocolate Sauce, Warm Fig Bar with Cream Cheese Ice Cream and Port Sauce, and Lavender Creme Brulee. 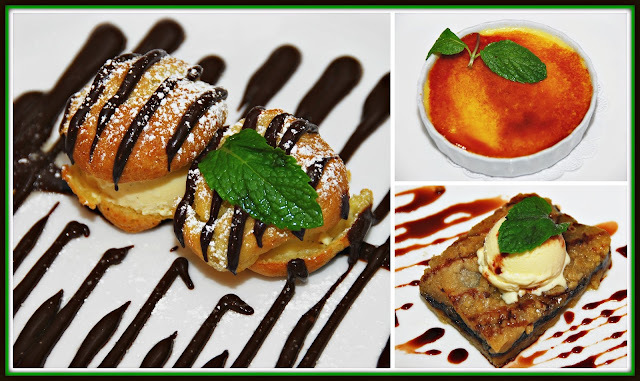 All three were delicious, but the profiteroles were over-the-top amazing! The perfectly cooked choux, rich vanilla ice cream, and deep chocolate sauce combined for a sinfully fun treat. 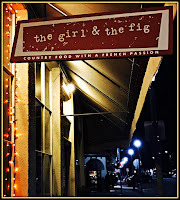 I highly recommend dinner or brunch at the girl & the fig for an amazing meal when visiting Sonoma. We headed back to the Fairmont and fell right into our comfy beds. After a busy day enjoying amazing wine and food...we were ready for some much-needed sleep. I slept like a baby the entire night, and then woke up early to check out the Fairmont's Willow Stream Spa and have breakfast at Sante restaurant. Willow Stream is a short walk from the hotel's main building, through the lovely grounds. As we approached the spa, we stopped to check out one of the heated pools. After a quick dip in the pool, we headed over to Willow Stream. Even though we didn't schedule spa services this trip, our stay included a day pass to experience the spa's pools and the Bathing Ritual, an hour-long self-guided co-ed bathing circuit that features a soak in the thermal hot tub, cold-water shower, steam and heat saunas, and a warm soaking tub. The bathing ritual left us rejuvenated and energized...ready to take on the rest of our day. Before checking out of the Fairmont and heading to Napa, we visited Michelin-rated Sante for a late breakfast. With a variety of sweet and savory dishes and a gorgeous setting, this Sante was a fabulous dining experience. 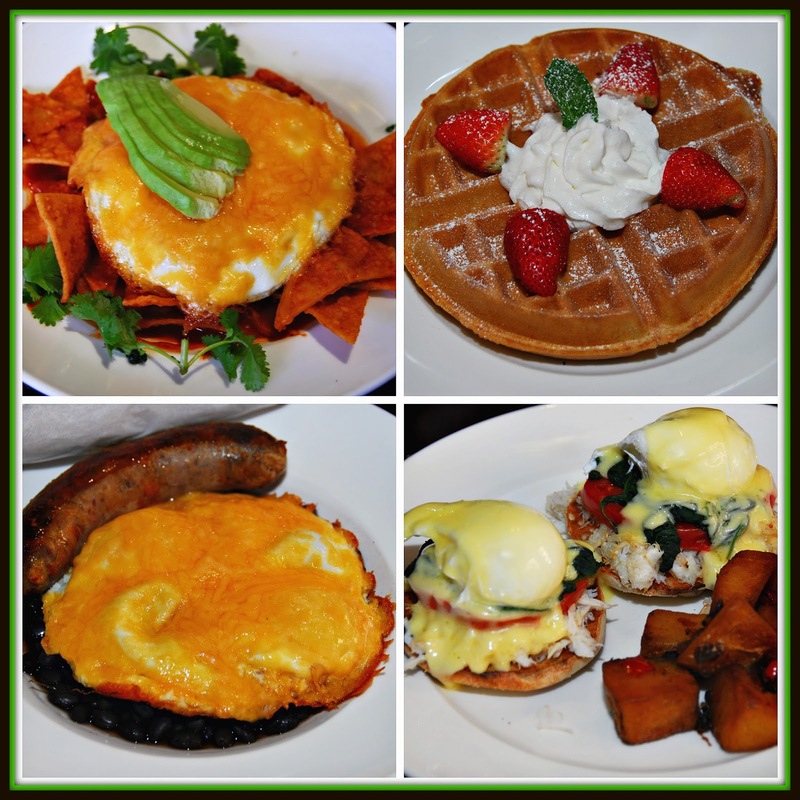 Between the four of us, we ordered the Jalisco Chilaquiles, Strawberry Belgian Waffle, Huevos Rancheros, and Jumbo Lump Dungeness Crab Eggs Benedict. Everything was delicious and beautifully presented! The chilaquiles was topped with organic eggs, avocado, salsa and sour cream over oganic corn tortilla chips tossed in a Guajillo red sauce -- amazing! The waffle was crispy outside and tender inside, then topped with strawberries and Vermont maple syrup. The huevos rancheros was topped with organic over-easy eggs served on organic corn tortillas, served with black beans and a link of chorizo. Finally, the eggs benedict featured poached organic eggs, lots of fresh Dungeness crab, baby spinach, tomatoes, and rich hollandaise sauce. 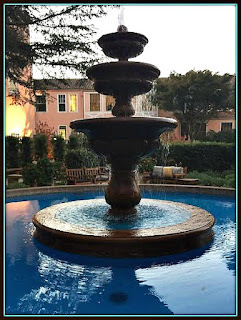 What a fabulous way to end our stay at the Fairmont Sonoma Inn & Spa! 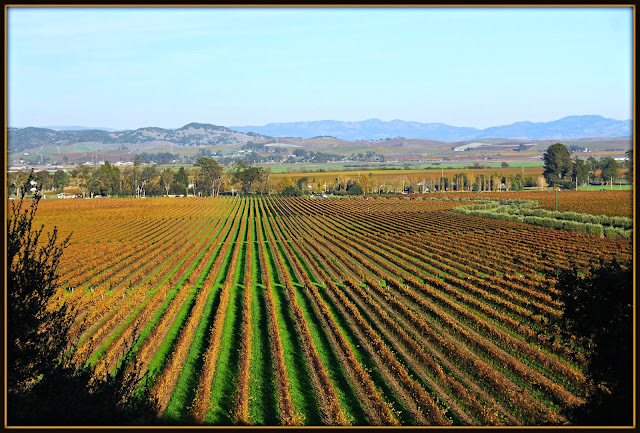 I can't recommend highly enough spending a day or two in Sonoma the next time you visit California's Wine Country. The people are friendly, the wineries and food are amazing, and the vibe is laid-back and casual. 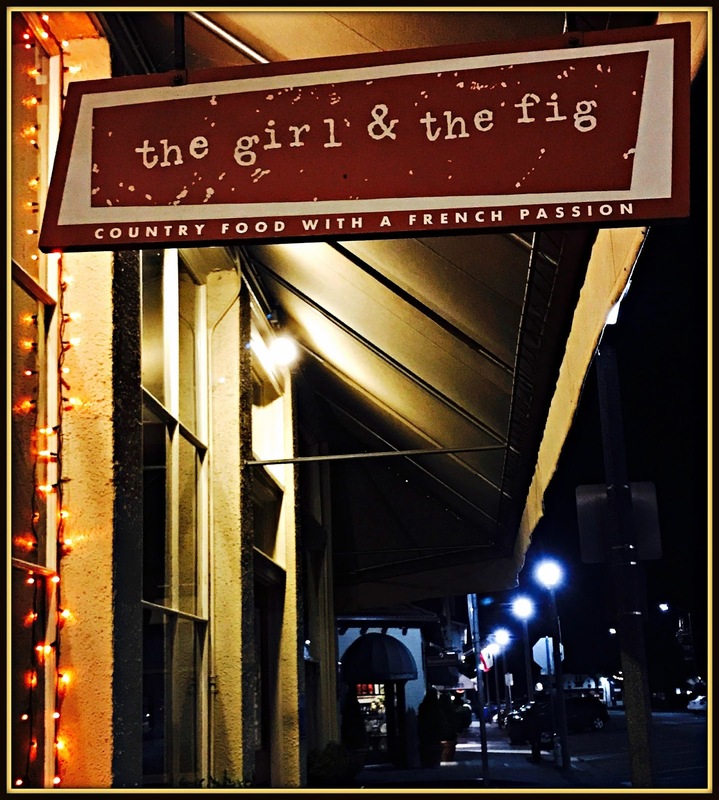 Stops at WALT, Arrowood, and Gloria Ferrer will provide plenty of amazing wine and food pairings, and the girl & the fig will be one of the best meals you'll ever have! The 24 hours we spent in Sonoma definitely left us eager to come back and explore the area more on future vacations. Disclosure: The Fairmont Sonoma Inn & Spa provided a one-night stay to facilitate inclusion in this article. The wineries featured provided us with complimentary tastings, and the girl & the fig hosted us for dinner to facilitate coverage. As always, all opinions expressed are solely those of The Weekend Gourmet. Unless noted, all photos are copyrighted by Michael K. Garcia and Crystal Werkheiser. They may not be copied or otherwise used without prior permission.